Take one bowl, whisk curd, besan, salt, turmeric powder and water very well. Keep aside. Heat 1 tablespoon oil in pan and stir fry capsicums on high flame for 2 to 3 minutes.keep aside. Heat remaining oil in another pan, add musratd seeds, let them spultter. Add hing, onion, sesame seeds and sauté for 1 to 2 minutes. Add curd mixture into this pan and mix well. Add red chilly powder, garam masala, amchur powder, coriander powder and mix well. Keep sttring continuously till mixture become semi thick. Add stir fried capsicum and mix well. Cook for 2 to 3 minutes. 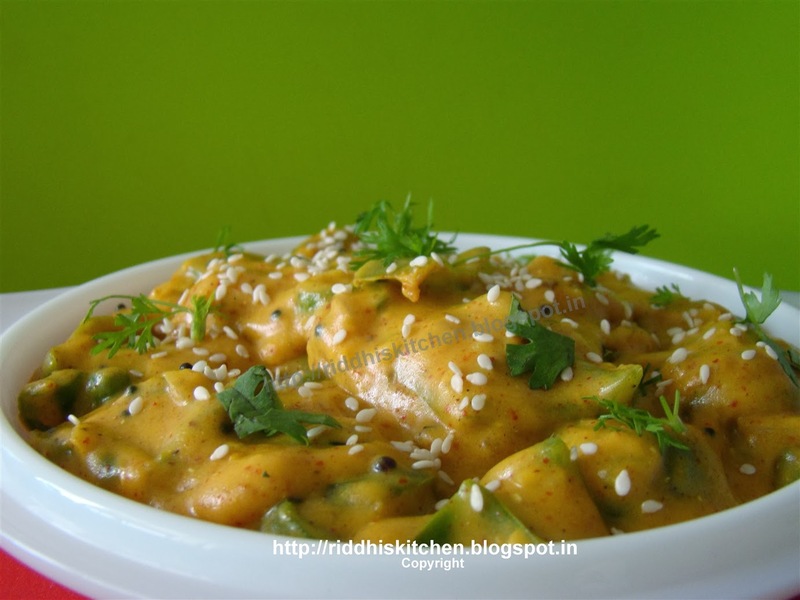 Garnish with fresh coriander and sesame seeds and serve hot with roti or paratha. Thank you for your lovely comment. I am happy that you like the capsicum masala recipe. I will be soon uploading hadva cupcake. keep visiting.